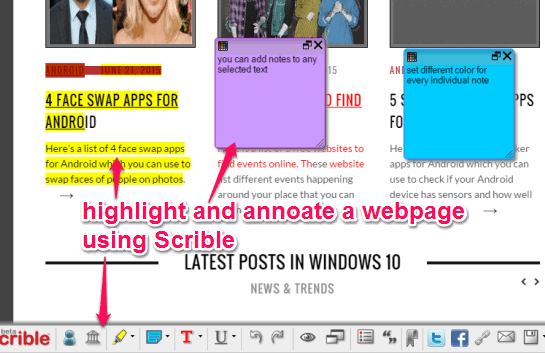 Scrible (beta) is a free website to highlight webpages, add notes to webpages, and share with people. It is a much better website as compared to similar plugins and website(s). Where other web apps let you only highlight webpages with default Yellow highlighter, this website lets you select the highlighting color, highlight any selected text, and add a note to a particular selected text. 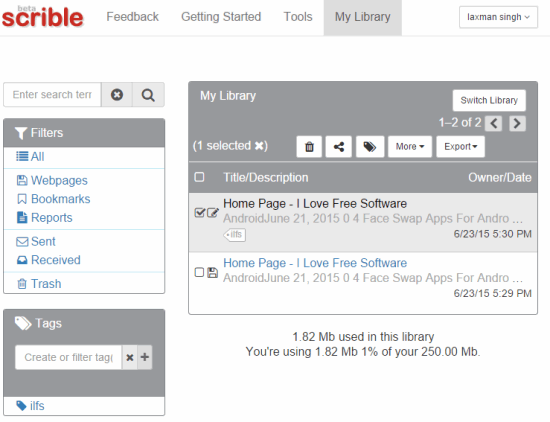 Apart from this, you can also store the webpages in cloud on your free Scrible account. Whenever you want, you can share highlighted webpages with others, and people don’t even need to create any account to see those webpages. In the screenshot above, you can see the notes and webpage highlighted by me using this fantastic website. There are two types of free accounts provided by this website: Basic (with 125 MB free storage) and Student Edition (with 250 MB free storage). You can also earn additional free space via additional tasks. All your highlighted and annotated webpages are stored in My Library. After accessing that library, you can delete any webpage to free up the space and share webpage to Twitter, Facebook. You can also set permission to each individual webpage: allow others to edit or remove the annotations or let them only view the webpage. It provides a bookmarklet to easily open the tools to highlight and annotate a webpage. You can also make any text bold, italic, and underline the text. How to Highlight Webpages, add Notes, and Share The Annotated Webpages using This Free Website? Step 1: Go to the homepage of this website and create your free account. Its homepage link is given at the end of this review. 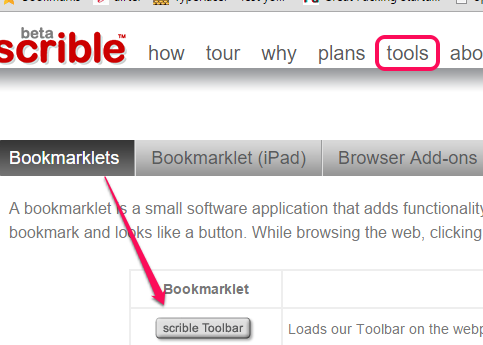 Step 2: Access Tools option and find its bookmarklet. After this, drag n drop that bookmarklet to the bookmarks bar of your preferred web browser. Highlight text: This tool provides a color palette and let you highlight the selected text with desired color. Change Text Color: It is used to change the color of selected text of webpage. Add Note: Using this tool, you can select a particular text and add a note for that text. 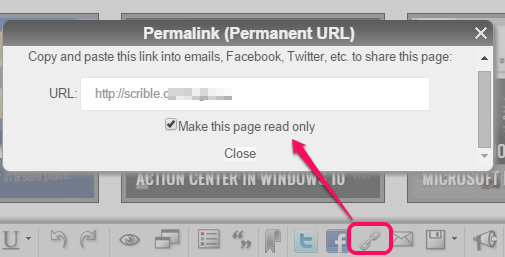 Permalink: This tools helps to generate a permanent to that webpage, so that you can share it with any person you want. Save: To save the annotated webpage to your account for later use, this tool is handy. Use any of these tools according to your requirement and share the annotated webpage. 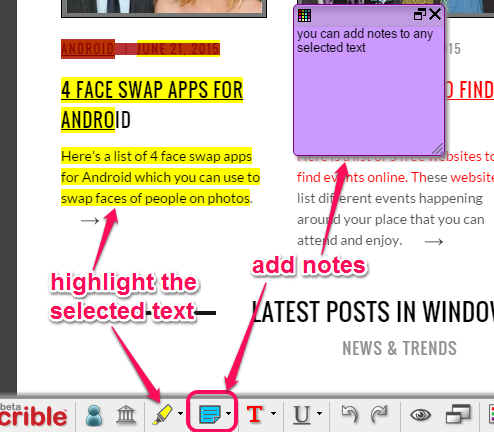 Scrible is surely a fabulous website to highlight, annotate, and share edited webpages with people. Whether you want to highlight important text in a webpage or explain a thing, this website would be perfect. It’s in beta version though, but works perfectly.